No purchase necessary to enter. No limit on number of entries. Previous winners not eligible. 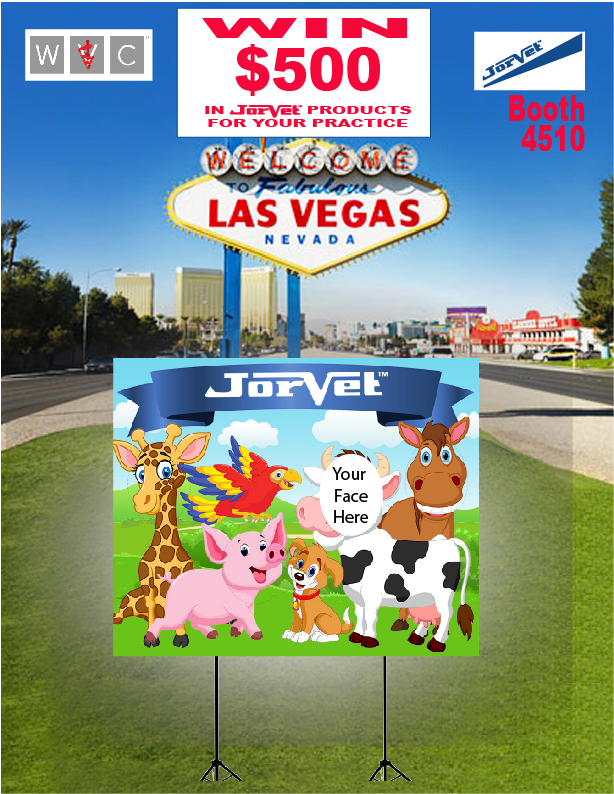 Photo must be taken at the Jorgensen Laboratories, Inc. booth #4510 at Western Veterinary Conference 2019 in the JorVet frame. Posts must include #JorVet, #WVC2019 and the JorVet logo on the image to be eligible to win. Jorgensen Laboratories is not responsible for taking picture for participants. Winner will be based on number of likes on combined social media platforms. Posts must be set to public. Winner will receive $500 in JorVet products. Winner must pay sales tax. Shipping is included. Winning order will be shipped to clinic. Winner will be selected on Friday, February 22, 2019. Winner will be announced on Jorgensen Laboratories Facebook, Twitter, Instagram and LinkedIn pages.